"With a few exceptions, we have the technology or the knowledge that we could go to Mars if we wanted with humans. We could put a telescope on the moon if we wanted," "The technology is by and large there. It boils down to what can we afford?" 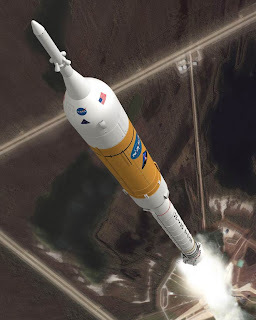 Before this entry I had written a long response that I was going to publish about why the various teams that had presented to the US HSF Committee were dead wrong about making pitches for low cost alternatives to what NASA already had on the drawing board. Those pitches were heresy I thought. We (the fanatical space loving community) are our own worst enemy. Maybe ARES I isn’t the right next-gen rocket, but don’t go tossing the ARES V out with it on another Swiss Army knife spacecraft. We were committing the cardinal sin of pitching lesser solutions that will leave us in the same place we are today and not fulfill our Moon or eventual Mars destiny. I was thinking if we’ve got the platform (the committee) then let’s pitch the entire vision and strategy and all the parts that will make it happen step-by-step. If someone bites on a proposed solution because it’s cheaper we’re going to be stuck with it. Then we will be wondering why China is planting a flag on the Moon and trying to leverage space as more than a political venue, but as a resource. We’ll have no one but ourselves to blame and the detractors will say you proposed it in the first place. It will be a convenient excuse to once again diminish America’s role in space. As Norman Augustine’s comments reflect this is once again about costs. Not a vision, but bottom line dollars. What can we do for the least amount of expense. The majority of the members of Congress that will vote on the NASA budget are uneducated about manned space exploration. The last thing we want to do is give them a low cost solution that won’t get the job done. They’ll approve it. Then I realized that the teams making these proposals had tossed their rose colored glasses away and are pitching these ideas to save the space program. They know what we all know deep down inside. The space program lives today and will live tomorrow on the table scraps fed it from the Congressional spending trough until we change it. It is frustrating indeed to see proud American industries teeter on the edge of survivability by their own hand and get bailed out with billions and here we have our nation’s technology leader, NASA, treated as a panhandler. Forty-years after the Moon landing and here we are again. Welcome to déjà vu for it is 1969 once again. Shortly after the Moon landings Richard Nixon wanted the space program cut. Cut completely. Interestingly enough Eisenhower who created NASA found out late in his Presidency that the organization was planning to put humans on the Moon. He was furious and called it a waste of public resources. Whether or not his then Vice President Nixon espoused that belief or carried that philosophy into his own Presidency is not known, but ten years later after Nixon had been elected President the dismantling of the space program had begun. Once again it was about costs. The Shuttle we fly today was born of that era. A compromise of what was needed versus what could be afforded. 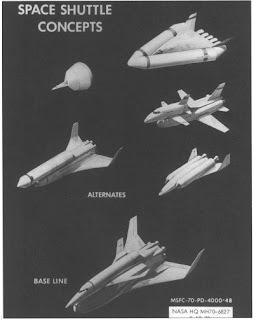 Eventually, the Shuttle program was carved down to a high risk, lesser capacity vehicle than what NASA originally requested. The resulting design would have to operate at the extreme limits of machine performance and risk. One that was soon realized couldn’t meet the very expense guidelines that gave birth to it. Costs were paid not only in dollars, but in human lives. There wasn’t a vision that anyone could have dreamed of that would have expanded the program back then. Despite the fact that we were a driving space force we stepped aside and let time pass the space program by… but for a few dollars. There is an old saying in the business world that if given enough money, time and resources you can get anything done, and therein lies the problem. In the world NASA operates in those are precious commodities that are not in abundance. Now factor that to get those three you need a strong base of support from the American community, strong political support from the President and Congress, and an economic climate that will make the sale of the program palatable to all interested parties. To get a blank check you would need a climate of overwhelming support on every side of the spectrum much like the one that existed in the sixties. Perhaps a climate where Americans felt of the verge of being labeled second best to another country and were determined to win a race to prove a superior technical and political way of life. The recent economic meltdown and the global economy we live in has already acclimated Americans to the thought of other nations rivaling the U.S. like China or a group like the European Union who GDP already rivals the United States. Unfortunately, Americans are becoming accustomed to living in a world where our dominance is questioned. Perhaps a resurgent American Space Program could be the answer, but for the immediate future I don’t see any of a resurgence of a strong public or political will coming together in a way that will make that viable at least under the current approach. We need a sea change, a paradigm shift of how we approach public support for the space program and how we define our interests in space. It’s time for us, the dedicated loyal followers to do what we can to re-architect how Americans view space. This is no small task by any means. That’s not a next decade, next year, or next month thing. That’s a NOW thing. As the saying goes “The right time is NOW”. We the space enthusiasts are everywhere and as such have the ability to work grass roots locally to start the process of bringing greater awareness and visibility to America’s efforts in space. To inform, excite and educate. The times have changed in America on many fronts which will make our battle for space all the more difficult. This is a different social, technical, political and financial America then has existed at anytime in our history and is far removed from the climate of 1969. Over the four decades since the moon landing Americans have bore witness to a technical and information revolution. One that has dazzled and amazed us and one that makes feats like launching rockets to the moon an expected feat and not a daring feat. It’s not that most American’s aren’t interested it’s that their expectations have been reset. Ask most about going back to the moon and the response wouldn’t likely be “why should we”, but rather “why can’t we” as if to say this seems like something we should have already been doing. People are less dazzled because the imitation of life by art is so good. I heard a story once that after the movie Apollo 13 came out Buzz Aldrin asked Ron Howard where he got the launch footage because he hadn’t seen those angles before. The answer why he hadn’t seen it? It didn’t exist. The images were computer generated yet they looked so good that even the second man on the moon was fooled. The average kid today must think going to the moon is boring. After all it’s a couple of people cramped in a small capsule for a few days and then walking around on the surface. Just like on the series “From the Earth to the Moon”, just like in Apollo 13 or perhaps even a comparison to Star Trek or Star Wars. The computer generated images of today far exceed the best footage of the space race and venturing to the moon seems tame by the comparison to the adventures of Luke Skywalker. Lost is the technical marvel that you don’t see that it takes to get there and the bravery to venture into space. Perhaps it is I who is wrong about how I look at the space program. Maybe I am hanging on an era that has passed us by. The ISS and the cooperation of so many countries is a great example of how space unites us. Yet inside of me I can’t help but want another American flag on the Moon or an American on Mars and I can’t picture an Orion capsule launched atop an Arianne 5 rocket. It’s a pride issue for our country and for the space program. We are the leader in space and we shouldn’t we relinquish that title but for a few dollars. Kennedy was driven by competition and his spirited challenged rallied the country largely because it was a challenge. It was as a boxing match between cold war warriors that pitted the U.S. against the dreaded Soviet Union for the title of national pride and to be victorious in the greatest race the world had ever seen. We didn’t just want to win, but tower over our opponent as they lay on the mat. Yet in this era I am willing to compromise to save the dream of putting humans into space. Perhaps it is that spirit of cooperation not competition that will put humans back on the Moon and make a Mars journey a reality. Maybe spaceflight isn’t a U.S. thing, but a human thing. Something we all do collectively. Either way it is in jeopardy. There once was a self-proclaimed “lone voice in the wilderness” within the space program. 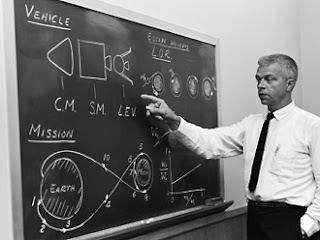 That voice belonged to John Houbolt, a NASA engineer who risked his career and standing within NASA to promote his vision for lunar orbit rendezvous to anyone who would listen. He did this standing in the shadows of powerful figures like Wernher Von Braun whose direct ascent method was seen as a front runner early in the planning for Apollo. Houbolt’s persistence paid off and America got to the moon using his method. It was Von Braun who immediately after the LEM touched down on the surface of the moon turned to Houbolt flashed the OK sign and said “Thank you John”. It is the spirit that Houbolt displayed to stand and fight for what he believed in, to be heard over the voices of giants and never be resigned to letting others decide what he knew to be the wrong course that we must emulate. It is up to us to carry that same type of spirit forward so that we can get back to the Moon and on to Mars. We need to find our voice and find a way to reach a broader audience, educate them, and get them interested in space. It’s time for us this collective group of enthusiastic followers and dreamers of space to seek out ways to do more. Perhaps we need to recruit the likes of Elon Musk, Founder of SpaceX and reach out him about forming an organization to help us educate Congressional leaders, political candidates, school kids and the general public. In a short time he’s taken a start-up space venture to one that will be carrying cargo and possibly crew to the ISS. He’s seems like a good place to start. If we don’t act and don’t do something we will lose this battle once again. The time is act is NOW.